There's a lot to catch up on. Let's talk knitting. It's been quite a while since I posted here & much knitting has been accomplished. I've knit six pair of fingerless mitts, several boot toppers (none of which I photographed) and two scarves similar to this one. On Thanksgiving, I finished the above slipstitch scarf. In real life, the colors are much more muted & not so mustardy looking. 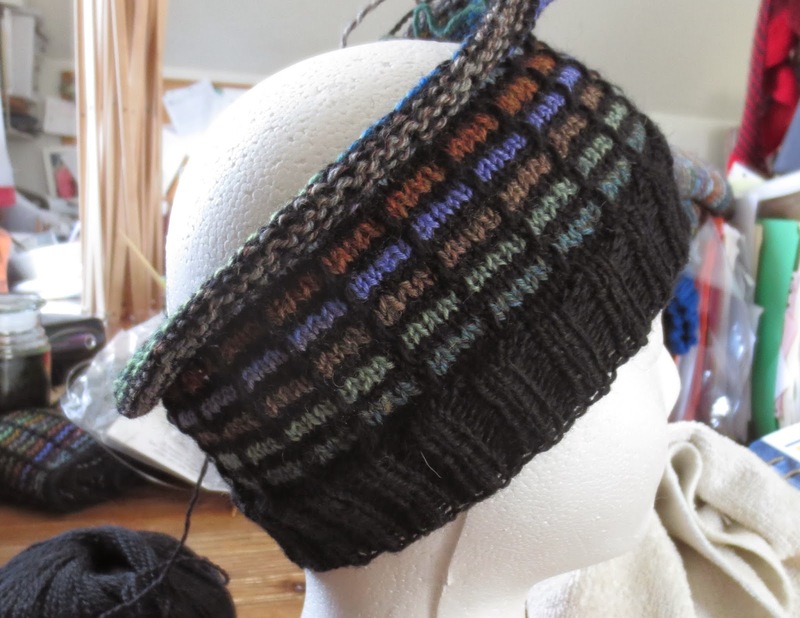 I liked the pattern so much I immediately cast on for a matching hat. I also started a white scarf in a simple lace pattern. I love the feeling of the knitted fabric on this one but I may end up ripping it out anyway. I bought this cone of yarn at GoodWill the other day. There's no content label on it & I have no idea how much yarn there is but the price was too good to pass up. Knitted up, it feels like cashmere but the price made Red Heart look expensive. Anyway, about this scarf, I'm just not sure. 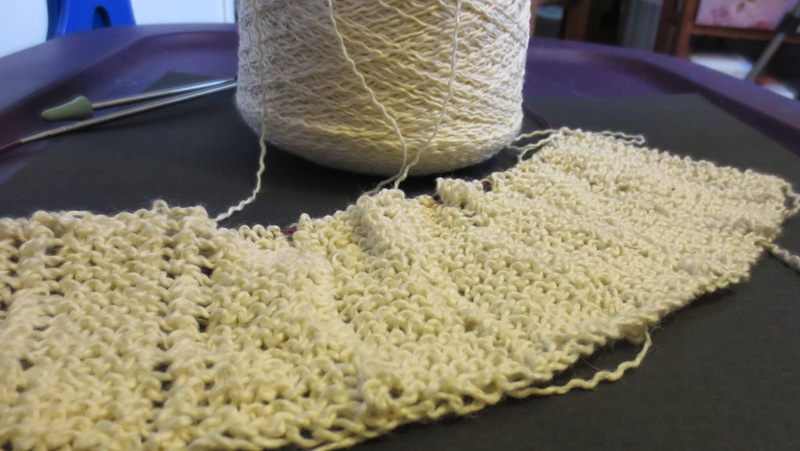 Not sure I can stand to knit an 11 inch wide scarf in white in a simple, one row lace pattern. The boredom had already set in before I had four inches of knitting. And have I mentioned I like looong scarves? I'm pretty sure this one can officially be classified as a permanent UFO. So, why is this post titled "Ketchup"? Have you ever seen the movie Pulp Fiction? I love the ketchup joke and every time someone says "catch up" I automatically think "ketchup." Anyway.... I had a lot to catch up on. And why is that, you ask? Because I completely screwed up. I decided to go pro & buy my own domain name & move everything I sell onto my own website. What a disaster! First & foremost, what in the world was I thinking when I thought the beginning of the Holiday shopping rush would be a good time to make that kind of change? Good Lord! Apparently, I wasn't thinking at all! And secondly, I've been having massive issues with the site. Even my IT guy is having problems with it. I won't go into details, mainly because I am NOT an IT guy & don't understand the details, but let's just say it's a disaster & not much of anything works on it. And every "fix" just makes it worse. So, for now, I'm back here and in my Etsy shop. Mr. IT continues to work on it but I'm thinking I may have to pay him more than the pizza & Mt. Dew I've been supplying. So, that's my story. Please forgive me for the confusing excited announcements about new sites & locations that led you nowhere and for not posting here for so long.